With our intelligent WhatsApp chatbot development, we help businesses transform the way they engage with customers. 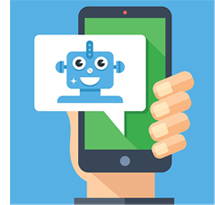 Our WhatsApp Chatbot developers provide highly sophisticated and intelligent chatbot solutions best fit for domains such as e-commerce, entertainment, and customer support etc. An advanced WhatsApp chatbot could use the best in artificial intelligence (AI) technology to learn and respond. With major improvements in AI technology and the rising popularity of WhatsApp messaging app, WhatsApp bots have become the next big thing in the digital domain. WhatsApp chatbots provide intelligent answers to most frequently asked questions. Besides WhatsApp, Google’s Google Assistant, Apple’s Siri and Samsung’s Bixby are three popular AI based chatbots. With WhatsApp Chatbots, programmers can create conversational interfaces for various business scenarios like banking, travel, and entertainment. What is a WhatsApp Bot? In his keynote speech at F8 event in April 2016, Mark Zuckerberg lauded chatbots for their ability to transform the way we communicate with businesses. Since then chatbots, notably, Facebook owned WhatsApp Chatbots have been the talk of the town. In technical terms, a WhatsApp bot is a computer program that simulates human conversation through artificial intelligence. Besides WhatsApp, bots or chatbots are now being used prominently by major companies, financial institutions and e-commerce giants. With WhatsApp chatbot development, programmers aim to help global businesses build, connect, deploy, and manage intelligent chatbots to interact with their users. They are the most common rules based chatbots developed by developers. These chatbots are coded smartly and their functionality is quite simple. These chatbots fetch their responses from a database and determined by pre-coded rules. Developers edit rules whenever it’s required to improve bot’s functionalities in accordance with the commands. The chatbot sends an error message if can’t find a correlating response from the database. Machine learning chatbots are more advanced and sophisticated than rules based chatbots. They are coated around the best of artificial intelligence. This makes these chatbots more conversational. A conversation with a machine learning bot is much more personalized. Upon interaction with a human, these chatbots learn to recognize specific patterns and store that data for future reference. As time passes, they become well versed with both and commands. With intelligent chatbot development, businesses can transform the way they engage with customers. Now they are opting for intelligent chatbot solutions that are best fit for business domains such as e-commerce, entertainment, and customer support etc.